When smoke from the Thomas Fire started to stifle the city last December, retail conditions on State Street were already in bad shape. 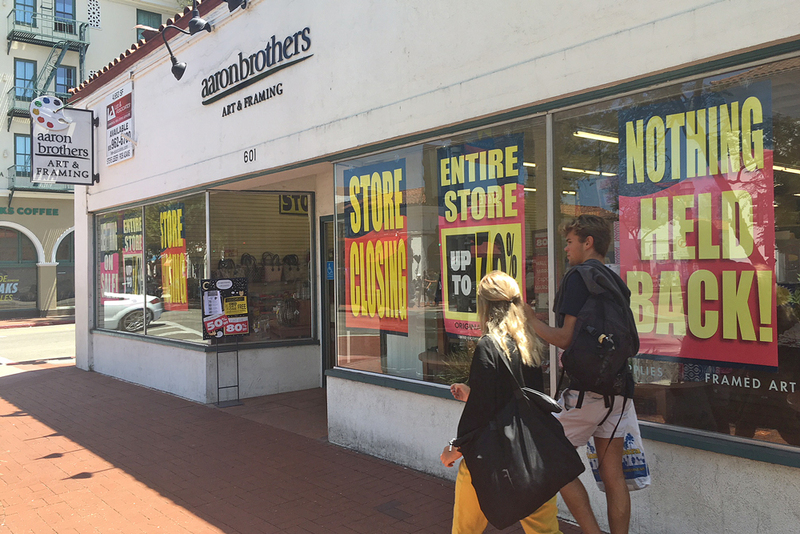 The shift from bricks-and-mortar business to online shopping has delivered a significant blow to Santa Barbara businesses. Conspicuous vacancies dot State Street, and businesses, locals and tourists say homelessness and vacancy discourage people from visiting the downtown area. Wildfire smoke forced businesses to close their doors during the holiday season, and the deadly Jan. 9 Montecito debris flow destroyed and damaged hundreds of homes, and flooded Highway 101. Economic recovery from the disasters will take years. “Looking ahead, the profound destruction and disruption caused by the Thomas Fire and the Montecito mudslides will have ripple effects on South Coast commercial real estate for years to come and is expected to slow down sales activity in the near term,” the recent UCSB Economic Forecast Project report said. Now, almost six months after the debris flow, the conditions on State Street, even with the most optimistic face, are at best the same, with little marked change in vibrancy in the downtown core. Staples is the latest big box store to pack up and leave, reportedly leaving at the end of August. Recently Chipotle also closed its doors, as did a Verizon store. These stores follow a slew of other chains that have departed downtown, including the Macy's department store that anchored Paseo Nuevo, Brookstone, Guess, American Apparel and Panera Bread, to name just a few. But the conditions are back to where they were last year, Brown said. Brown, the broker for the Staples building at 410 State St., said, however, that deals are happening, and there is interest in commercial properties. Ray Mahboob, a commercial property owner with dozens of properties on State Street, said one of the biggest challenges facing downtown is the extensive and lengthy permitting process with the city of Santa Barbara. He said he had a tenant for one of his buildings, with a signed lease, that up and left because of the expensive delays in the city, and instead is opening a coffee shop in Goleta. Mahboob said the planning department often asks new tenants to make entrances and exits to their properties compliant with the American Disabilities Act, and while the city's Accelerated Permit Program fast-tracks exceptions for some ADA-compliant requirements, it's not happening consistently. “As a city, we can’t build a bad reputation as being difficult,” Mahboob said. Santa Barbara City Administrator Paul Casey said Santa Barbara is experiencing some of the same problems afflicting other communities. “State Street retail, and retail in general nationwide, continues to go through major shifts and adjustments,” Casey said. A report by Hayes Commercial Group found that there is lowered demand for downtown commercial space from national retailers and that, contrary to popular opinion, some State Street landlords have actually lowered rents in recent years. “We surveyed all the leases on the prime 600 to 1000 blocks of State Street from the past two years, and compared the new rent to the previous rent paid for the same space (and) on average, the new rent was 12 percent lower than the inflation-adjusted previous rent,” according to a May report from the UCSB Economic Forecast Project. Mahboob agrees that there is reason for hope on State Street. He said the key is for property owners to be active and seek out clients. Ken Oplinger, president of the Chamber of the Santa Barbara Region, said Santa Barbara is still a desirable area that people from all around the world want to visit. The downtown area faces the same challenges as it did before December, with the added need for regional economic recovery from the Thomas Fire and Montecito debris flow.